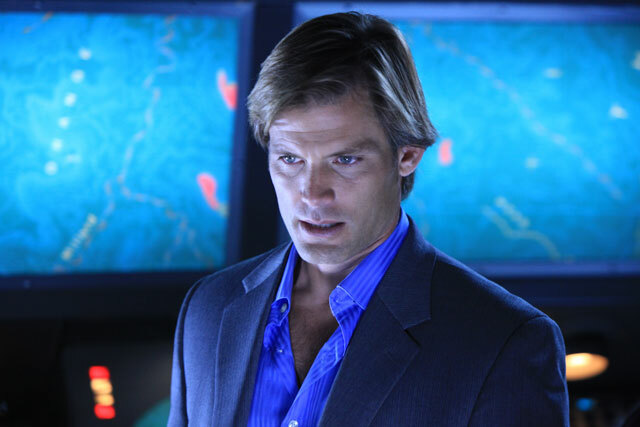 Casper Van Dien looks good -- before looking up! -- in Turbulent Skies. There’s something about disaster movies that make them fun, no matter how cheesy, and here’s the latest. Anchor Bay released the airborne thriller Turbulent Skies on DVD on July 26, 2011. In the film, everything appears to be fine on a fully loaded 747 jet airliner that’s equipped with a revolutionary automated piloting system, until the plane veers off course … directly into the path of a huge storm! When the airplane heads for a large city and the Secretary of Defense authorizes the military to shoot the it out of the air, it’s up to the system’s inventor and his team to avert the disaster. Turbulent Skies is a DVD premiere movie that sports all the appropriate straight-to-DVD credits: The film is directed and co-written by Fred Olen Ray (Hollywood Chainsaw Hookers) and stars Casper Van Dien (Born to Ride) and Patrick Muldoon (together for the first time since Starship Troopers in 1997), along with co-stars Nicole Eggert (TV’s Baywatch) and Brad Dourif (Chain Letter). We haven’t seen a trailer, so we can’t say whether it falls in the cheesey- fun or action-fun category — maybe a little of both? No bonus features are on the DVD, which carries a list price of $26.98.